Who Made It? If Ben Shahn had not signed his painting of Sacco and Vanzetti, an art historian could still assign, or attribute, the work to him based on knowledge of the artist’s personal style. Although signing (and dating) works is quite common (but by no means universal) today, in the history of art countless works exist whose artists remain unknown. Painter,” the anonymous ancient Greek artist whose masterwork is a depiction of the hero Achilles. Scholars base their attributions on internal evidence, such as the distinctive way an artist draws or carves drapery folds, earlobes, or flowers. It requires a keen, highly trained eye and long experience to become a connoisseur, an expert in assigning artworks to “the hand” of one artist rather than another. Sometimes a group of artists works in the same style at the same time and place. Art historians designate such a group as a school. School does not mean an educational institution. The term connotes only chronological, stylistic, and geographic similarity. Art historians speak, for example, of the dutch school of the 17th century and, within it, of subschools such as those of the cities of Haarlem, Utrecht, and Leyden. The interest many art historians show in attribution reflects their conviction that the identity of an artwork’s maker is the major reason the object looks the way it does. For them, personal style is of paramount importance. But in many times and places, artists had little to say about what form their work would take. They toiled in obscurity, doing the bidding of their patrons, those who paid them to make individual works or employed them on a continuing basis. The role of patrons in dictating the content and shaping the form of artworks is also an important subject of art historical inquiry. ce. Marble, 1′ 5″ high. Glyptothek, Munich. portrayed. In these cases, the state employed the sculptors and painters, and the artists had no choice but to depict their patrons in the officially approved manner. 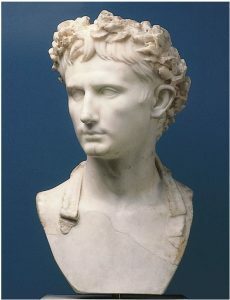 This is why Augustus, who lived to age 76, looks so young in his portraits (fig 1). Although Roman emperor for more than 40 years, Augustus demanded artists always represent him as a young, godlike head of state. All modes of artistic production reveal the impact of patronage. Learned monks provided the themes for the sculptural decoration of medieval church portals. Renaissance princes and popes dictated the subject, size, and materials of artworks destined for display in buildings also constructed according to their specifications. An art historian could make a very long list of commissioned works, and it would indicate patrons have had diverse tastes and needs throughout the history of art and consequently demanded different kinds of art. Whenever a patron contracts an artist or architect to paint, sculpt, or build in a prescribed manner, personal style often becomes a very minor factor in the ultimate appearance of the painting, statue, or building. In these cases, the identity of the patron reveals more to art historians than does the identity of the artist or school.